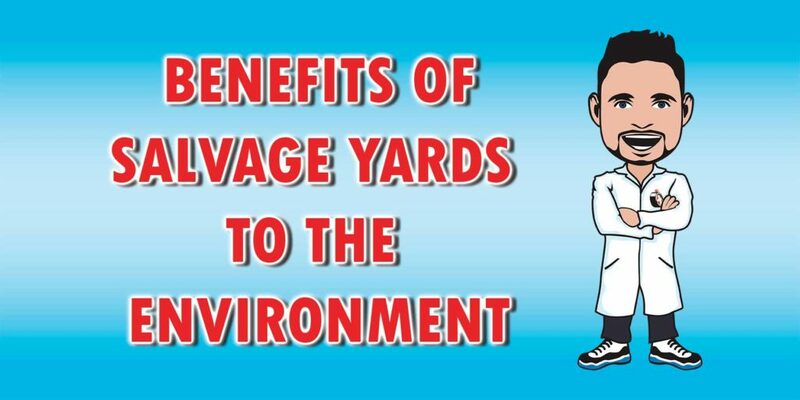 Though “environmentally friendly” might not be the first thing that pops into your mind when you think of salvage yards, the truth is that car salvage yards are incredibly helpful for the environment. “Reduce, reuse, recycle” is a slogan that salvage yards definitely live by! We all know how important it is to recycle to reduce the amount of waste going into the environment. There are a seemingly unlimited number of cars around the country that are sitting in driveways or empty lots, going unused and degrading. These cars can pollute the environment and they’re a valuable source of metal and spare parts that could have been recycled. The only way to turn a junk car from a piece of unsightly trash into a source of recycled material is to go through a salvage yard. Salvage Yards recycle cars that are past their expiration date, either by fixing them up or by stripping them for scrap metal and spare parts. It would be a huge waste to simply throw away a junk car. These machines may not be of much use to a driver anymore, but even the most broken-down junker is a source of valuable scrap metal that can be recycled into a huge range of new products. Rather than letting these materials go to waste, it gets a second life. Many junk cars are also chock full of parts that still work and can be put to use in other vehicles. To throw these parts away or let them sit in a landfill would not only be wasteful, but it would also be terrible for the environment. Auto salvage yards know how to get the most out of every junk car so that nothing useful gets left behind. If you care about the environment, you know that mining isn’t exactly the most Earth-friendly activity. It uses fossil fuels and releases harmful toxins into the water, soil and air. Yet, between cars, phones, computers and other products, we humans sure use a lot of metal in our daily lives. Salvage yards are a source of common and important metals, like steel. The more metal that is recycled through salvage yards, the more we can reduce the amount of mining. Cars contain a long list of chemicals that aren’t great for the environment, like antifreeze, power steering fluid, and battery acid. The average junk car contains between 5 and 10 gallons of these chemicals. If these substances aren’t handled properly, they can damage the soil, water, and wildlife of the surrounding area — not to mention that they can cause discomfort or even health problems to humans. Similarly, car batteries should never simply be thrown away. They can release lead into the environment, and they can be put to much better use even if they’re dead. Salvage yards know how to handle this properly.